Nokia is reportedly working with Korean developers on a face recognition application for some of its upcoming phones. This application is designed to identify the faces of the person whose photos you have clicked using your mobile phone. All the user needs to do is to identify the face in his/her album just once. Post that, the application performs a search and identifies all similar looking faces stored on the phone. Apart from the face recognition capabilities, it will also feature time and location based features. The application will make its debut with phones running Series 60 OS and having at least a 3-megapixel camera. Like Nokia last week, Qualcomm has been talking up the future of phones, and the company gave us a sneak peek of what to expect a short while down the road: face recognition technology tied to social network search technology, so you can find out what a stranger just tweeted simply by pointing your handset at them. Is Facebook stalking about to get a whole lot worse? We’ve seen in-picture face recognition start to appear in mobile phones recently, with Sony Ericsson promising the tech will make it into the Xperia X10 early next year. But Qualcomm reckons it’s going to get much more integrated and advanced. Gilbert admitted that the possibility raised serious privacy issues – you could theoretically pull up a person’s home address through automatic whois requests – but ethics aside, it’s an interesting next step for augmented reality apps, which layer data over the surroundings and have started to take off in a big way over the last year. As phones get faster and more powerful, what’s to stop people integrating this form of search? Face.com is opening its photo-tagging system, based on facial-recognition technology, to Facebook members. 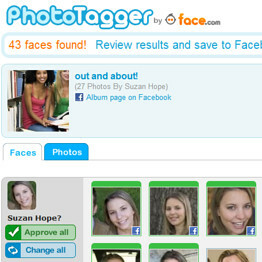 Face.com’s Photo Tagger app uses facial-recognition technology to help Facebook members tag photos of their friends. Photo Tagger, which launched to a limited group of users in July, scans a user’s photo albums on the social-networking site, then lets him tag faces it identifies. It groups multiple shots of each person, making it easy to tag large albums, and users can also adjust or remove incorrectly tagged pictures. Once a member has been identified, the app prompts him or her to approve the tag — a crucial privacy step, since he or she may not want to be labeled in a photo. It also works with a member’s current photo-privacy settings on Facebook. For users with lots of friends and photos, Photo Tagger helps them spread the word and ensure that their contacts see relevant shots on their news feeds, said Gil Hirsch, Face.com’s chief executive. Photo Tagger is free, though he said Face.com is considering fee-based services that it could provide over the system. He declined to say what they might be. Face.com is also introducing a new Photo Tagger feature, dubbed Face Alerts, along with the launch. It allows members to be notified through Facebook or email when new public photos are uploaded of them or their friends. “It’s a Google Alerts for faces,” Mr. Hirsch said, and a way for members to gain more control over where their image appears. The app has taken off even in its alpha phase — he said more than 35,000 people have tried it. TechCrunch called it a “time vampire” because of its addictive nature, though VentureBeat noted that it might even work too well, and that it could lead to more people tweaking their privacy settings to avoid the limelight. A set of articles concerning the same facial detection and recognition schemas. It seems to be available/coming soon on social networks, normal computer applications and mobile phones with bridges from one platform to another. Pushing this technology to the dark side will make possible to any one of us to be able to obtain the name, the address, or any kind of data about a person we can just see in the street, just by taking a simple picture. As the technology seems to be planned for huge deployment, people will be able to file/record their own personal/biometric data on any kind of devices/social networks, prior to any possible reaction of legal instances.